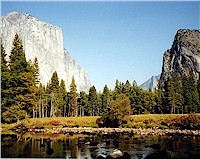 Yosemite is the most famous of California parks covering the eastern portions of Tuolumne, Mariposa and Madera counties. The Park covers an area of over 3,000 km� and reaches across the western slopes of the Sierra Nevada mountain chain. Yosemite is visited by over 3.5 million people each year, many of whom drive 3� hours from San Francisco and only spend time in the 18 km� of Yosemite Valley. Designated a World Heritage Site in 1984, Yosemite is renowned for its spectacular granite cliffs, glaciated U-shaped valley, waterfalls and hanging valleys, clear streams, Giant Sequoia groves, and biological diversity. Almost 95% of the Park is designated wilderness. Yosemite supports a diversity of plants and animals. The Park ranges in altitude from 610 to 4,000 metres and contains five major vegetation zones: chaparral/oak woodland, lower montane, upper montane, subalpine, and alpine. Of California's 7,000 plant species, about 50% occur in the Sierra Nevada and more than 20% within Yosemite. The Park contains more than 160 rare plants and some unique soils. Early European-Americans first used the term "Yosemite" to refer to the Indian people who were reported to live in a yet-undiscovered mountain stronghold. Only in 1851, when the Mariposa Battalion first entered the Valley in a war with the area?s indigenous people, the Miwok, did they coin Yosemite as a place name. Yosemite is derived from a Miwok word "Yehemite," which has been translated as "some among them are killers". Oso-meti of the Yosemite Bear People suggests the correct translation is "the killers" or "the grizzlies" (see comments below). Yosemite was set aside as a natural preserve in 1864 when Abraham Lincoln signed the Yosemite Grant, which gave guardianship of Yosemite Valley and the Mariposa Grove to the State of California. The main proponent of the park, LaFayette Burnell, who led the Mariposa Battalion and professed a 'take-no-prisoners' approach to the Miwok, wanted to "sweep the territory of any scattered bands that might infest it." Once the Park was established, it was run by the U.S. Army for the next 52 years before being taken over by the National Parks Service. The Miwok petitioned the U.S. government in 1890 calling for compensation for their losses and denouncing the managers of the park. "The valley is cut up completely with dusty, sandy roads leading from the hotels of the white in every direction? All seem to come only to hunt money? The valley has been taken away from us [for] a pleasure ground?." Their pleas were ignored and further evictions of remnant Miwok settlements were made in 1906, 1929 and as late as 1969. What the Miwok had noted was that the national parks, set up to preserve 'wilderness' regions 'unimpaired for the enjoyment of future generations' were also designed with a profit motive. Indeed, the first parks of Yosemite and Yellowstone, were created largely as a result of pressure from the railway-building lobby, which sought to increase the numbers of fare-paying passengers by routing their tracks near scenic sites for what today we have reinvented as 'eco-tourism'. 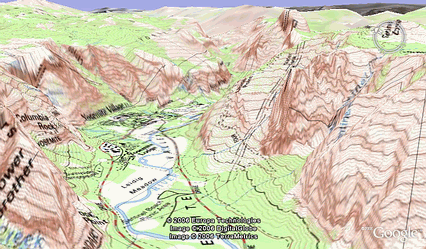 Yosemite is a large park, but the main tourist sights are concentrated in the Yosemite Valley. A paved road circles around the valley. Most tourists simply drive around the road and take pictures of the main sights. At present, cars are allowed within the Park. A free voluntary shuttle bus system is available to many areas throughout Yosemite Valley. Entrance fees are collected at all entrance stations.